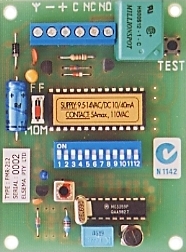 The FMR-212 is a crystal controlled single channel receiver, comprising of receiving, decoding and relay-output sections. A specially designed LARGE SCALE INTEGRATED CIRCUIT (LSI) is employed in the decoder section, which ensures operation at low supply voltage, highest reliability, associated with very low power drain. The receiver works on a digitally encoded 27 MHz frequency modulated (FM) signal. It may be used in applications such as the remote control of garage doors, gates, lights, alarms or in any other new or existing installations where the use of conventional wiring is difficult or impossible to accomplish. If the code of the input signal (from a transmitter) matches the setting of the coding switch on the receiver (up to 4096 combinations), an output is obtained i.e. the relay operates. This relay provides a clean set of contacts for switching DC current up to 5 Amps. As an antenna, a piece of any type of wire, approximately one meter long, will be sufficient for a reliable control range of up to 400 metres, with our FMT... hand transmitters. A longer wire or a proper 27 MHz CB-Antenna should further improve performance in reception. If a CB-Antenna is used, the shield of the cable must be connected to the "minus terminal". A push Button (designated as "TEST") is provided for relay output testing. In the momentary mode (MOM) the relay is only activated while the correct signal is received. When changing the slide switch from "MOM" to "FF" (flip/flop mode) the output relay is toggled with every correct incoming signal. This enables the direct use for switching on/off lights etc. In flip/flop mode, the relay always energizes at the initial "power-up". If a "latching-on" output is required, for example receiver is used together with a "Panic Button", a wire link is to be fitted as shown below. In such a case the relay can only be reset again by momentarily interrupting the supply. Care must be taken, not to bring a receiver near strong magnetic fields, such as DC-Motors, speakers, magnets for reed switches, transformers etc. as it would magnetize the coils and may cause severe de-tuning.